Katerina, this will be our first Sxisma Art Gallery interview about you and your work as a painter! 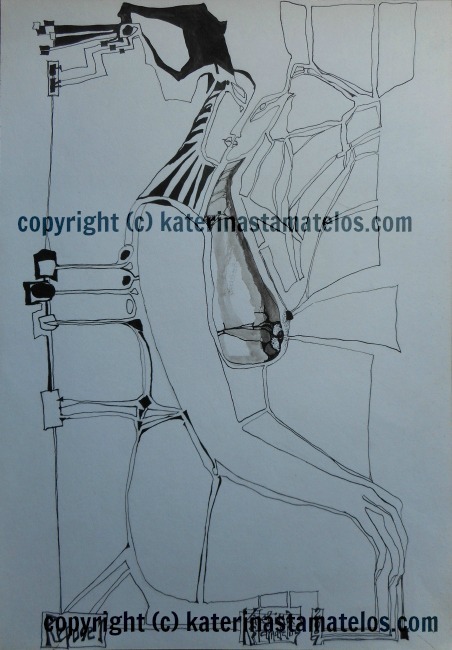 To make the reading of this interview easier to our online readers (and followers of your art work), we are going to address ourselves as SAG (Sxisma Art Gallery) and you as KS (Katerina Stamatelos). Are you ready? SAG: You have recently announced to us your excitement about your decision to participate in a group exhibition in your hometown, Thessaloniki. We strongly advised you against this and, over the next few days, we spent several hours discussing our different views on the subject over the phone: we, from NYC, and you, from Thessaloniki. What made you insist that much on participating in this group exhibition? KS: I have been repeatedly told from art professors that I am very talented and that I should proceed with my art work. SAG: We will investigate this specific statement of yours in a more detailed way later. But, just for now, please answer this simple question: "why"? And why in Thessaloniki, of all places? The city does not even have a succesful record of attracting serious collectors of art! KS: This is absolutely true. But, Thessaloniki is the city where I was born (the gallery was even just around the corner of the first apartment my family lived in, downtown). Plus, Thessaloniki "launched" my piano career (at the age of 20), my first appearance as a fashion designer (at the official graduation ceremony, where my two evening gowns appeared at the end of the show), and my composition career via two major concerts featuring my works (before I even started my composition degree in the USA!). SAG: So, it seems you thought that your city might bring you luck. Right? KS: No, definitely not. However, it was a very important experience which I have not regretted. I have learned a lot from it! SAG: Katerina, before we proceed with our Sxisma Art Gallery interview, we thought of inserting a painting of yours that might interest our readers. The title of the painting is Repose I and, as you have told us, it will mark a series of works under the same title. This particular version of it (in black and white) will NOT be seen again, as you decided to continue this series in color. We are not going to ask you the "why's", just post it as a document that will never be seen again as an original! Will this work be really forever lost? KS: No! I have photographed it (in high definition analysis) and is available for sale as an art print! SAG: So, where can our readers buy it? KS: I have inserted the link under the image. All of my art prints (not the originals) can be bought at Imagekind. This is a site I respect greatly, as it treats my (high definition) images with the utmost care. One can inspect them, very thoroughly, by clicking with the mouse on every desired spot! However, the images themselves are totally protected from online theft, which has become very common lately. SAG: Yes, indeed. And it is quite wise of you to take such strict precautions. KS: Online security is very crucial to me. I also do it as a courtesy to my art collectors. They would certaily be appalled to see their chosen work printed on cards, etc, without authorization! SAG: By the way, do you ever use this medium? Meaning, printing cards of certain of your art works? KS: I only allow it for "fragments" of some of my works or "previous versions" of them (again in fragmented form). There is a portal, Fine Art America, that does excellent work in high definition printing! However, they do not secure the online safety of my originals for sale: and this is a key issue to me. SAG: Katerina, let us now continue with your art exhibition experience. How was it? And what did you learn from it? KS: First of all, it was NOT an exhibition aiming at sales. We, the artists, could only exhibit few works (by paying a fee, even though we had been "selected" from a supposedly large number of portfolios sent) on a limited part of a wall. All art works were returned to us after the exhibition that lasted only 3 days! SAG: And how many artists were "selected"? SAG: Sounds like an excellent business deal (just do the math!) more than a genuine art exhibition. KS: Yes, the thought has crossed my mind. SAG: Do not get offended, Katerina, but in the today's "art world" more and more "opportunities" like this seem to pop up around the world. Art galleries find it difficult to produce sales: so, their next business deal are artists willing to pay for a "vanity exhibition" (the real term in the art world). Which, in turn, does more harm than good to the name of an artist! KS: I couldn't agree more with you on this! SAG: So, what were the reactions from the visitors? KS: I did not invite any friends of mine. Being away from my country for so long, has cut me from my natural support system. But, even at my first solo appearance with the State Orchestra of Thessaloniki, "my people" were no more than 30 (friends and family members). The hall had a capacity of 1,200 seats and was...packed from the invites of another soloist appearing at the same night! SAG: So, it seems that you are not good at "connection working". KS: Indeed. I am, let's say, plain horrible at this! SAG: One more reason for us having approached you to become your managers. You see, Katerina, we do believe that Great Art (or Music) does not require such hard work: greatness promotes itself on its own. Mediocrity, on the other hand, does need all this insane and constant promotion. KS: Strange that you say this. Years ago, a Greek conductor (Kavalieratos, now dead) was assigned to conduct the State Orchestra of Thessaloniki in my second appearance (Beethoven's First piano concerto). Immediately after the performance, he invited me for a solo recital at the Athens National Radio. The producer of the time (a strange figure whose name I would rather not expose) told him (in front of me! ): "we should promote this girl, she is very talented". Kavalieratos then turned towards her and answered: "this girl does not need any promotion. Her performances are promotion enough. She will make it without your help"! SAG: What a wonderful story! It speaks volumes for both you and this remarkable conductor! But, let us go back to the recent art exhibition and your experiences from it. KS: Right. The most exhilarating experience I had came from an art "conoisseur": a person, usually invited to art exhibitions, and also used to lecturing about art. KS: I will not publish his name without his consent. After all, the internet is a very public space. However, he was totally real, as all other artists participating noticed the attention he was paying to my paintings (and, in particular, the Three Little Girls) and started questioning me about "what" he had told me. SAG: Did you tell them? KS: No. This was a very sacred moment between him and me which I am not willing to share! SAG: Will you, at least, tell us? KS: No, again. As I have previously stated, the internet is a public space. I do not share the opinion of a personality I value that much without his consent. SAG: What was the reason for calling this experience "exhilarating"? KS: Just the fact that he has singled out these works as excellent. And, not only that! He also made a thorough (and completely accurate!) analysis of the emotional setting under which these works were born! He has singled out these works as my strongest ones (and, in particular, Little Gilr III). His statement that gave me hope for the direction of my art was: "here, you have stepped out of yourself and your personal pain and now this work (Little Girl III) has reached us and belongs to all of us"! SAG: This statement, coming from an expert, is ideed something more precious than gold for you! KS: Indeed! I will remember this statement for the rest of my life! And, quite frankly, it does give me the strength to continue. SAG: And now, let's come to the opinion of the art gallery owner about your works! We do hope that he expressed his thoughts and criticism about your art? KS: Indeed, he did. And, I found what he said quite informative! KS: First of all, he turned towards the Three Little Girls and called them my best works (which meant to me, that his knowledge about art was sound). However, he also dismissed them as "too difficult to sell"! On the other hand, the curator of the project made a suggestion to create a series of more "sellable art" (by using different palettes, but using the same pattern). When the exhibition was finally over and his "suggestion" sunk in, I had to laugh! KS: In music composition, we would call this "Theme with Variations": but, we would still consider it ONE work, not a "series" of works! And, in all honesty, I have never seen Picasso creating a "series" of works! They were all different from each other and the only similarities we can trace date back to his "pink" and "blue" periods. SAG: Very informative, indeed. You seem that you have been exposed to the "harsh reality of art sales in Greece"! SAG: One final question for you and, maybe, the most crucial one! SAG: It seems to us that, for you, there are only two ways to go. The first one, make sellable art. The second one, make art as you feel you should, by trying to break all expressive boundaries (even if it means that you cannot sell!). Have you reached a decision about this dilemma? KS: I haven't even felt this situation as a "dilemma" at all! My decision can only be ONE: I continue creating art as I feel it, art that may strike something in the souls of others, as it did in the one case I told you about. THIS is what a true artist should be looking for: to create a soul-to-soul connection. SAG: We are particularly happy about your decision. And, now, we will tell WHY we asked you this question. SAG: Because, had you decided to go for the "sellable-art" solution, our collaboration (as managers of your art) would be over! Frankly, because we are only interested in real art. And, because sooner or later, great art does find its way to the rightfull collectors!